Located at Victoria Place off Stafford Street. 1828 1858 Ralph Shaw Works built by Ralph Shaw and was subsequently run by him or his tenants. His executors still owned the premises in the early 1880's. 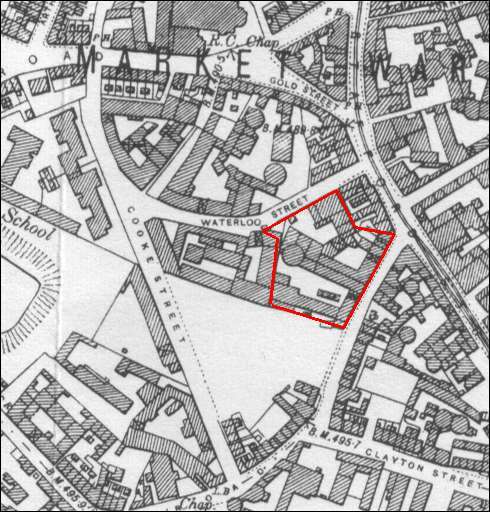 1850 1851 Cooke & Griffiths Cooke occupied part of the Victoria Works with Hulse (as Cooke & Hulse) 1835-55/6. 1858 1900 Joseph Finney & Co. In the late 1860's Finney began to produce China instead of earthenware; he was still at the works in 1890. 1912 1955 Cartwright & Edwards Cartwright and Edwards were at the nearby Borough Pottery since at least 1869. By 1912 they also took the Victoria Works. Cartwright and Edwards became a subsidiary of Alfred Clough Ltd. and in 1955 both the Victoria and Borough Works were sold to the Manor Engineering Co. Ltd. The Victoria Pottery works were pulled down and the Victoria Foundry was built on the same site. SOURCES: Jewitts 'Ceramic Art of Great Britain 1800-1900', Victoria History of the County of Stafford Vol. VIII.